According to Gallup, companies fail to choose the candidate with the right talent for the job 82% of the time. 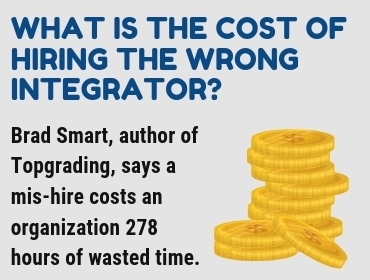 Brad Smart, the author of Topgrading, further estimates that a mis-hire costs an organization 278 hours of wasted time. Both of these are staggering numbers that are exponentially detrimental to an organization. These numbers are more damaging than one might think at first glance because they go beyond wasted salary (and the hourly equivalent of salary lost on wasted time). The Integrator is a high-level role, and the higher up the position, the greater the influence across the organization. In other words, there is greater opportunity for damage when the wrong person fills a high-level role like the Integrator. When the wrong Integrator is hired, the costs spill out across the organization with lasting negative impact to the bottom line; potentially for years. In companies running on EOS®, the Integrator is a critical executive-level role. Geno Wickman, the founder of EOS Worldwide, defines the role as “…the glue for the organization…[the one who] executes the business plan, holds the Leadership Team accountable, is the steady force in the organization…[and] who is the filter for all of the Visionary’s ideas…” (EOS Worldwide Blog). At VisionSpark, we understand the significance of the Integrator role and how the right Integrator can dramatically change a company. We have built a reputation on successfully placing executive candidates, including Integrators and key leaders, since 2012. 100% of the Integrators we’ve located for companies running on EOS® are still there today. Finding the right Integrator for your business is no easy undertaking. Even among many highly qualified candidates, not all of them will be right for your company culture or a good complement to your Visionary. According to VisionSpark’s Director of Search Division, Tonya Casey, we often have 300 highly motivated candidates vying for a single Integrator search — each of them actively interested in the opportunity. This typically yields three to five truly “superstar” Integrator candidates for our client. In our experience, only about one in 75 candidates are superstar caliber, so it’s critical to cast a wide net. We like to tease that once your organization hires the right Integrator, your Visionary will start planning their next five vacations. This may be a slight exaggeration, but having the additional support and the ability to trust that the company is in the hands of a capable Integrator will be a huge relief to your Visionary — and that’s no joke!